This is why I love the FM community because of developers like yourself who share awesome developer tools and personally have saved this fellow developer tons of time so I can focus on developing great stuff for my Filemaker clients which is how I make my living. Yeah, sorry. The server is a bit overloaded currently and it looks like I need to do a reboot. Hej Claus, good work! Had a very short look and appreciate the work you put down. Still, I believe this is something that should be integrated into the basic admin console provided by FM. We can agree that it tools to manage FMS17 is scattered into several places. That’s why I created this tool, so at least you have a single tool, that combines all “admin interfaces”. Thanks for this wonderful tool, Claus! This will save developers a lot of time and get them up to speed much faster. Kudos to Richard Carlton for the videos, too. And thanks for spreading the word, so we can help our colleagues. I have not tested this tool yet. Need to install the server first. For what I can see from the screenshot it is all I always wanted to have over the years. Having to constantly look for CLI commands, certificates storage and all other bits was always a pain. I saw the demo of “FMS 17 Missing Admin Tool” as part of Richard Carlton’s FileMaker 17 training videos. All I can say is “Wow”! What a gift! Thank you! NOTE: My username has spaces in it. Is that causing the HTTP/1.1 400 Bad Request? admin REST API does not support the same password characters as the web admin console. I’m pretty sure the you need to change your password and avoid spaces. Currently, I can not give you precise information on which characters is allowed and which is not. But try to create a password without spaces and with regular characters and numbers and it should work. Having the same problem as Klaus. Username has spaces in it. Password does not. I’ve put in 4 different emails but it doesn’t seem to have worked for me. Sounds like a tremendous tool that I’d love to have. Thanks for your generosity. We’ve had some issues, which is now resolved, so please try again. I’ve tried on 2 occassions to get the download link for the “Missing Admin Tool” and each time I have not received an email with the link. please advise if there is a problem. Great tool! Thank you. I am in the process of creating my certificate request and paste the info into Terminal. It appears to be processed. Where is the file located? Should it appear in the field of the Utility or do I need to copy and paste? If so, where is the Private Key File located on Mac High Sierra? Thanks! Please disregard my previous question. I missed your excellent Help on the SSL Info tab! Claus, I tried the tool today and I must say that it works really nicel Thanks for creating this wonderful masterpiece! Thanks for trying out this tool and to provide feedback. I am aware of the recommended -H “Content-Length: 0” but in my testings it was not required to make these commands work. However, I appreciate your feedback as it might be helpful to others as well. Thanks for doing this! FileMaker really dropped the ball on this. We all purchase FileMaker because its designed to be easy and what FileMaker did does not make things easier. I am not clear on how to run the tool. Can I install it on my FMS 17 and run it from my host computer? My FMS server does not have FM 17 installed on it. I am also getting the API: 1631 error when I try to login using the REST API, even before it asks me for the FMS credentials. My FMserver username has a space in it, but my FMserver password does not. I appreciate your assistance and can’t wait to start using your tool. Hi Ben and thanks for your interest. You open the tool in your local copy of FMPA17. 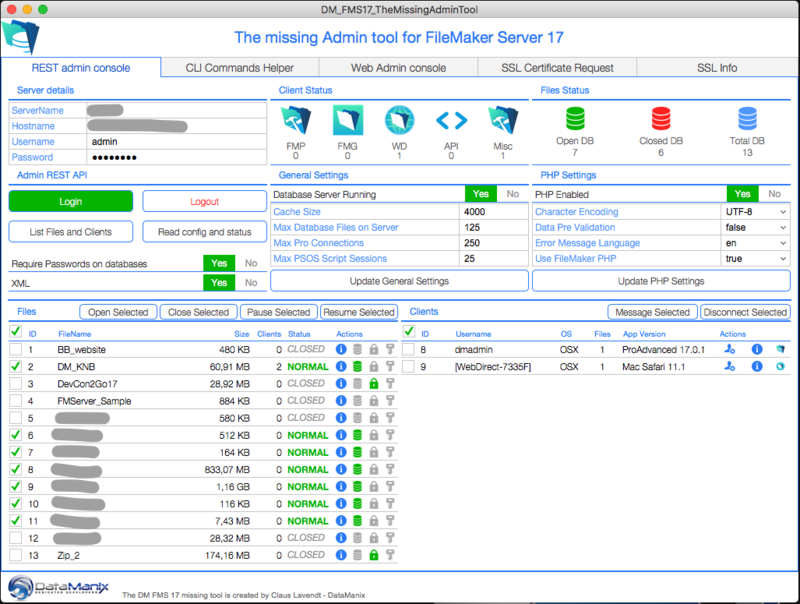 Make sure you can open the admin console of your FMS17 in a webbrowser on your local computer. On the first screen, you enter the FQDN of your FMS17 and the credentials. If you get a 1631 error, when you try to connect via the admin API, this can be an indication that you need to change your password for the root user of the FMS17 admin console. As others write above, the password needs to be alphanumeric with no spaces. Even if you can set a password in the web admin console of FMS17 with special characters, such is not supported via the admin REST API. UPDATE: I solved the problem. I ran it from my regular computer and used the local IP address of the FM server (192.168…) as the hostname, and it connected. Log entries is another big thing missing from the FAC. The ability to watch log entries is essential for server admins. We have created FMS WhistleBlower as a kind of response to this need, along with so many other needs. Recently we release a BETA with known bugs. Since we release it for free to the community, it also means that it gets low priority over customer projects. That’s the reason it took us 2 years to release the first BETA, although we have been using it internally for 18 months. An addition to FMS Missing Admin Console, that could give you log entries is not a small task. So I will not add such feature to a free tool. Time simply doesn’t allow that. Hi – I appreciate the work that went into this tool and your offering it to the community for free. I’m using it with FMS server on the same machine, and have been able to login to the REST API. It correctly reports all the status info, databases, status etc. However, when I try to close a database, the database icon turns blue temporarily and then goes back to green, and the database never closes. Closing it from the web admin interface works fine and your tool then reports the db as closed, but I can’t use the tool to actually close it. Exact same situation for opening a closed database. Thank you for your interest in this tool. Please look at Jeroen’s comment above. He suggest to put Content-Length: 0 in the header for the open/close commands. As I write, in my tests while making the tool, this was not needed on the 3 machines, I tested with, but that might be needed for you. Hi Claus – thank you. I tried replacing the $Curl variable in line 40 with the suggested value, but unfortunately it didn’t make any difference. I don’t have any other tips right now. I’m really busy preparing for DevCon and I will need to debug the code, in order to find the issue. That being said, the tool should work. A lot of people have downloaded it and have it working. No worries, totally understand. I can just open the databases from the web admin panel of course. Any thoughts on what I’m missing? The SUDO command requires your computer password. I sounds like you have used your FileMaker Server password in the command line prompt. Rick, did you ever get this figured out? I’ve done a number of installs of FMS 17 so far and have only now just run into this issue, installing on a new Mac Mini running High Sierra with nothing but FMS and FMPA installed. I can open the Admin Console using the Username/pw entered during the install process but running almost anything from the command line generates the Permission denied Error: 9 response. I’ve tried without sudo using the FMS credentials and with sudo using the Mac Account credentials. The only command that seems to run without this error is fmsadmin restart admin server and fmsadmin -v (Version number). just installed you tool, pretty exciting. I have an issue though: when I click on the Web Admin Console Tab. . . I get nothing displayed and no error message. FMS 17 is installed on my computer, it’s a dev server. The computer is an iMac running Sierra. I ca open the server console without any issue. Is there something I am doing wrong ? On the REST admin console I have set ServerName to the name of my computer and de Hostname to 127.0.0.1 – I also tried localhost that didn’t work either. That’s the problem. You need to setup a FQDN for your server and you should also install a custom SSL certificate. Things will not work correctly, until you setup and use FQDN. Please watch some of the other videos on this site, where we try to explain this topic. the FMS Server is only accessible from inside the office, there is no way to access it through Internet. Then we don’t need SSL protection. Is there some way to use the included Self Signed Certificate ? No. There is 2 modes for FMS17; Encrypted WITH Custom SSL Certificate or NOT encrypted with no certificate. So no way to use self signed certificates. If you turn off SSL, you can manage your server via the web admin console, but the admin REST API requires custom certificate and SSL. It really doesn’t matter if your server is only on a closed LAN. It is built to be secure and require SSL with Custom certificate. So you should always install a custom certificate and turn on SSL. Thank you for making your tool publicly available. I was wondering if per chance the tool included the ability to turn on or configure notification for completed backups? The article above alludes to the fact you can only do this now via the API. We are moving to FMS 17 this evening and I have only just become aware that this function has gone from the admin console interface and I really need to enable this somehow. I had a quick look after I downloaded the tool but cannot see it in the great wealth of options you have included. 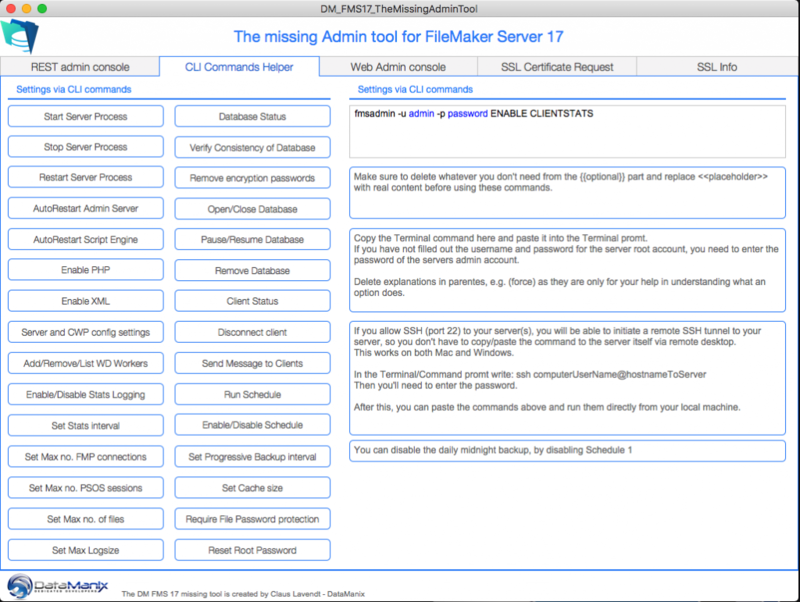 “DM_FMS17_TheMissingAdminTool.fmp12” was created by version 17.0 of FileMaker and cannot be opened by this version. Use version 17.0 to view this file. Please make sure you are in fact trying to open the file in FMPA17. This is really a great tool, thanks very much! However I ran into a problem I cannot solve. I used your tool to start the php service and everything seemed fine. But I couldn’t open a php page in my browser. After restarting my Mac (Mojave) no change. Thanks for the interest in our free tool. It sounds like you did not install PHP with your FMS17 installer – or at least it didn’t get installed correctly. The error message you posted indicate that php library, provided by the FMS installer is either not installed at all, or the configuration is not correct. Either way, a re-install, should help. The API error of 1631 is unrelated. This is a connection error to the admin API. This process is running through the nodeJS server and not dependent on Apache. Most likely you either entered a wrong username/password or you have a password with spaces or special characters. Even if you are able to log into the FAC with these credentials, the admin API does not support all characters. So you could try changing your password to be alphanumeric. Many thanks for your answer. I will take the steps you indicated and will let you know the results. Right now the webserver and admin console don’t work at all anymore. Yes I have a ‘&’ in my password. Never had any trouble with that before. Do you mean that we will not be able to work with PHP in the future? 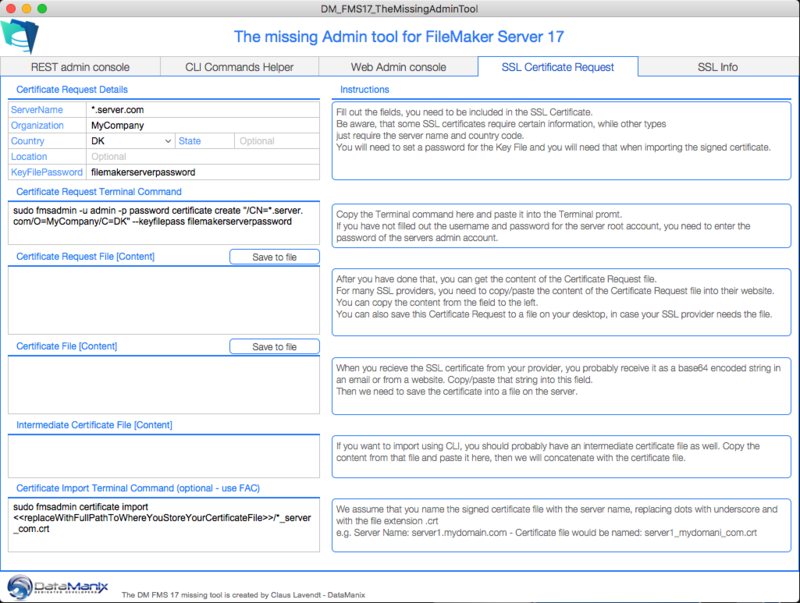 In the future, FileMaker will pull the FM PHP API from the FileMaker Server. When that will happen, no one will know for sure right now. But it will happen and FileMaker have told us to start moving from using the PHP API to using the data REST API. Hi Claus, thanks for your answer. I did all you suggested, removed the ‘&’ out of the admin password, activated PHP, restarted mac, but it resulted in no different behaviour at all. During installation there was no mention of PHP installing. I haven’t installed FMS17 in the last couple of weeks, but as far as I remember, you still get the options to install PHP and XML during installation. My experience is that you should install everything from the start, even if you don’t want to use it. Then you can always turn it off afterwards. I went back to a clean install of Sierra and a clean install of FMS 17. Choosing the FM PHP gave again a webserver crash. Choosing the system PHP doesn’t give a crash, however PHP pages still don’t show. Sounds like you have installation issues, which you should contact FMI support to get help with. Well, last update of Sierra did the trick. 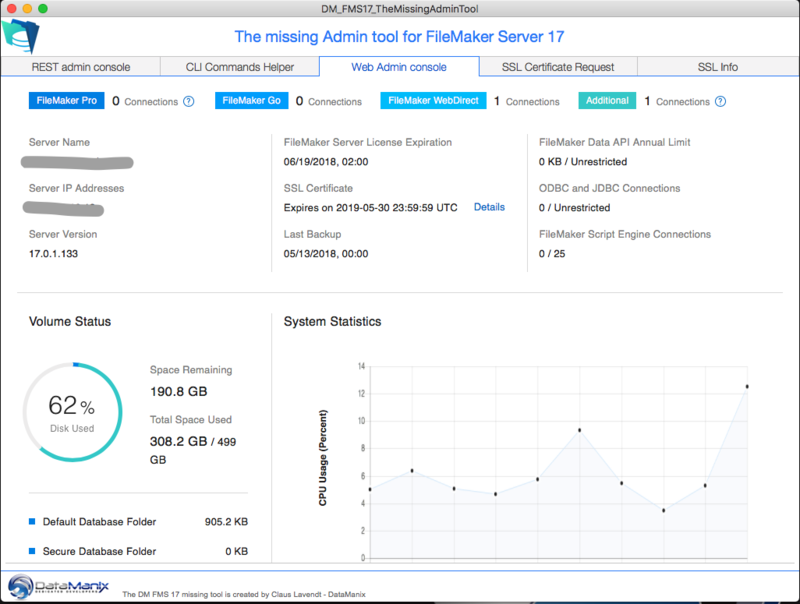 FileMaker changed to the use of the FileMaker PHP. this is just to congratulate you to a fantastic tool and your attitude. Thank you very much for sharing this wonderfully useful tool with the community. I kept getting the 1631 error – I tried changing the admin password a couple of times. In the end I got it to work but it seems like the FM Admin API does not like passwords that start with a number. Maybe? I can’t find any documentation about the admin password. Is there a specification for the password? My advice you get a 1631 error try a short simple password, just letters, to test, then you can go back to a secure password when it’s working. Indeed, we need better documentation from FMI, but we also have to acknowledge that the admin REST API is currently in beta. I can confirm this and it was my issue as well. Password was 28holmes18. Essentially, this comes down to the FM JSON functions, that override the type setting. So e.g. in this case, the JSON function thinks your password is a number and then it formats the password as a number. However, the admin API expects a string. I should have accounted for that in the tool, but clearly this was an oversight. However, you can easily fix this yourself by adding Quote() function around the password field in the login code. Then it will always be treated as a string. The quotes for JSONString must be removed to make it work with passwords which are only numbers. I think the quotes around JSONString must always be removed. Login succeeded after I made this little patch in the login script. This is an embarrassing bug, I made. Old habits with always putting strings in quotes – and FileMaker is not complaining nor is it handling the JSON Type. Fortunately, this is easy to fix, since you all have access to the code, so you can just remove the quotes around the JSON types. Only a few places, mainly in the login script. Thanks for pointing this out here. I really love this tool! I decided to test it with a server setup I have here with about 35 files. I am quite frustrated with the 17 admin console interface, as I cannot easily open/close files that are in a folder (I have a dev and a production folder). You obtain that data in the file list, so I plan to make a portal filter that allows me to make folder selections. I also cannot see who’s logged into which file using which credentials. So my plan is to expand on your development and add a user interface for that. I think I have to parse out the “guestFiles” nodes, and make records from them. They contains accountNames and privsetNames, that’s exactly what I need. One could argue that this is a waste of time, as FileMaker will possibly improve their admin console. But it seems like they are perfectly happy with what they offer right now, and I cannot wait any longer. Peter, as always, you are a brilliant mind! Don’t overestimate my brilliance, I’m just a regular guy, who likes to stand on the shoulders of giants, like Todd Geist, who is really saving me a lot of time with projects like this. I use his “JSON Generator”. Now that is a briiliant tool, that is splitting up the returned JSON into tables and scripts. Allthough the virtual list technique is awesome, I feel it’s somewhat slow for a lot of files. So I will take an approach where the JSON reply will be parsed in stored records (hence Generator). I plan to use it single user/local, avoiding multi-user issues. Isn’t it great, that you can just combine and modify to your likes ? Thanks to taking the tool for a spin and use it – and for your contributions to the community. Amazing File. Thank you Claus. I am noticing a bug, I can seem start/pause/stop files using your GUI interface. everything clicks, but the status doesnt change on the server. However, if you read the above comments, there is a bug in the tool. Look in the scripts and look for places where there is a JSONsetElement () function. The JSON types are wrapped in quotes, which they shouldn’t be. Just remove the quotes and everything should work fine.